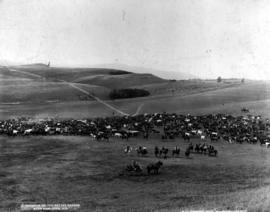 "A roundup on the cattle ranges near Kamloops, BC"; possibly Douglas Lake Cattle Company, visitors in foreground. "Breaking camp, Downton's survey party on the Cariboo Wagon Road near Clinton". "Bud" Watts Ranch West Of Clinton. Commemorating last spike ceremony 23 January 1915 near Basque. "Dawson Falls on the Murtle River, tributary of the Clearwater River, tributary to Thompson River, tributary to Fraser River". 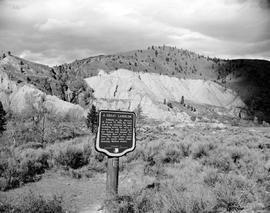 "Diversion dam, Barriere plant, City of Kamloops". "Fourth Avenue Methodist Church, Kamloops, BC." "Helmcken Falls under winter conditions; Murtle River power possibilities". "Helmcken Falls, a sheer drop of 450 feet on the Murtle River, tributary of the Clearwater River, tributary to Thompson River, tributary to Fraser River". "Interior view of Barriere powerhouse, City of Kamloops". Commemorating last spike driven 7 November 1885. "Nicola Valley stockyards, near Merritt, BC." "Old Hay meadows, 59 miles on the Cariboo Road north of Clinton; Pacific Great Eastern Railway". "Type of country east of the 70 Mile House at Bonaparte River just east of Clinton and west of the North Thompson River". "Wild hay meadow near Clinton, Pacific Great Eastern, 59 Mile House, Cariboo Road".